If you live in North America, you might encounter venomous snakes in your part of the country. The good news is that most of these poisonous snakes don't account for many human fatalities. The majority of the deadliest snakes on the planet live on other continents. It's possible for humans to survive the bites of many extremely venomous snakes with prompt medical attention. Oxyuranus microlepidotus, the inland taipan, holds the dubious title of the world's most toxic snake. The amount of venom from one bite of this Australian native is enough to kill 50 people. Fortunately, humans are rarely bitten by this 6-foot-long snake, who lives deep in the outback. The inland taipan's color varies from dark to light brown depending on the season. The snake's diet consists primarily of rats. The inland taipan's cousin, the similar-looking but larger coastal taipan, Oxyuranus scutellatus, is also deadly. Another relative, the Papuan taipan, lives in New Guinea. Because of the commonwealth's lack of medical facilities, far more people die from Papuan taipan bites than the other species. Mark O'Shea, author of "Venomous Snakes of the World," considers the Russell's viper the most dangerous snake he has ever encountered. Daboia russelii is found in China, India, Pakistan and other parts of Asia. Bites from this snake are among the leading causes of death in Sri Lanka. Victims are often farmers working in rural rice fields, where the snake hunts for prey. Death generally results from kidney failure, because the venom causes the blood to clot. Russell's viper ranges in length from 3 to 5 feet at maturity. Dark brown spots run the entire length of the body's yellow or tan base coat. The beaked sea snake, Enhydrina schistosa, also known as the hook-nosed snake, is another Asian native. Found along coastlines, it also lives in parts of Australia. This venom of this 4-foot-long gray snake is extraordinarily toxic. While it feasts primarily on fish, it can kill humans near the shoreline with its deadly bite. Pseudonaja textilis, the Australian brown snake, causes the most human snakebite deaths on its native continent. A minute amount of its venom can kill a person. Also known as the eastern brown snake Down Under, this long, thin snake can move quite rapidly. He lives throughout eastern Australia and is especially common in pastures and forests. Because he consumes rodents, this snake is often found on farms, where most human bites occur. Rattlesnakes differ in size and coloration, but all of them sport that telltale rattle that lets a person know of their presence. The Mojave rattlesnake, Crotalus scutatus, boasts the most toxic venom of all rattlesnake species. 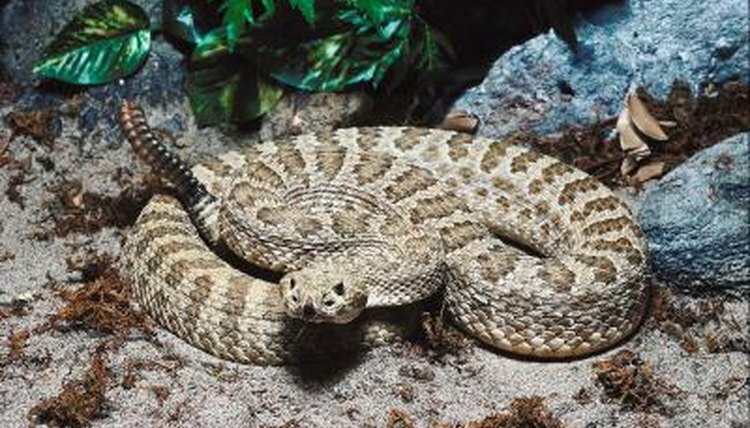 However, the less venomous prairie rattlesnake, Crotalus viridis, is responsible for the most human bites. Crotalus horridus, the timber rattlesnake, kills the highest percentage of humans with his venom. The Mexican West Coast rattlesnake, Crotalus basiliscus, dwells in central and South America. This large rattlesnake combines highly toxic venom with a particularly nasty disposition. The South American rattlesnake, Crotalus terrificus, is another big snake with a bad attitude.